If you're overweight and find it difficult, perhaps even painful to exercise, we are here to help! Not only is our NASA-inspired AlterG antigravity treadmill great for rehabiliation purposes, it is also an excellent modality to use in any weight loss program. As featured on News 12's Long Island Naturally Segment, the AlterG allows you to train at a fraction of your body weight, thereby reducing impact and compensations through your joints. You will be able to walk and even run to help improve cardiovascular fitness, speed up your metabolism, and lose weight all without the onset of joint pain. 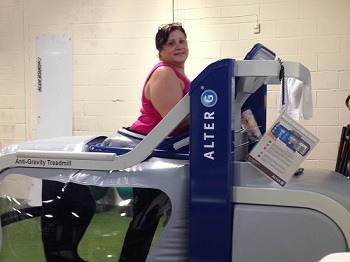 We have many options for you to choose how you train on the AlterG. Busy schedule? You can buy time and use the minutes as you like. Training on the AlterG may also be covered by some insurance carriers. Please call our office for more details.